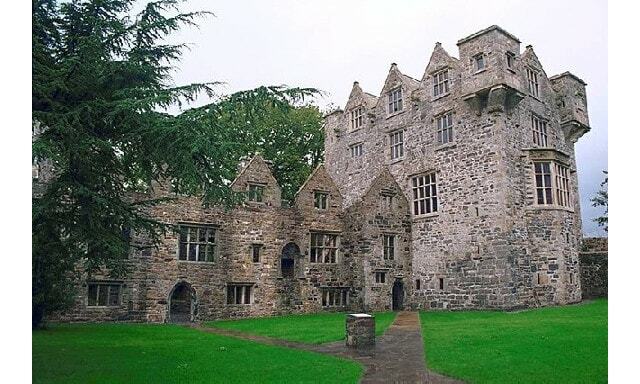 Donegal Castle consists of a 15th-century rectangular keep with a later Jacobean style wing. The complex is sited on a bend in the River Eske, near the mouth of Donegal Bay, and is surrounded by a 17th-century boundary wall. Most of the stonework was constructed from locally sourced limestone with some sandstone. The castle was the stronghold of the O'Donnell clan, Lords of Tir Conaill and one of the most powerful Gaelic families in Ireland from the 5th to the 16th centuries. For most of the last two centuries, the majority of the buildings lay in ruins but the castle was almost fully restored in the early 1990s.